Is it any wonder we are playing at our lowest ever level? What goes on tour should stay on tour and not embarass the rest of the club. 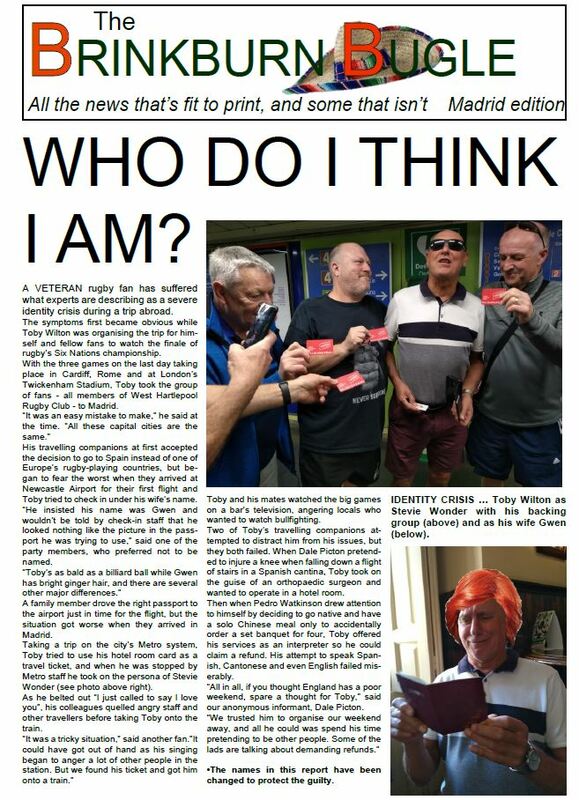 Having seen the article in his hide away in Turkey, Toby is quoted as saying,"I am surprised that an amateur journalist can produce such an accurate report so far from the action". Gwen reaction was "GINGER I will have him. It is believed that Gwen has instructed her solicitors Messers Hadaway and Shite to being action against the Bugle. What kind of rugby club is it where members of good standing freely meet up with the express purpose of drinking ale and simply having a good time? Disgraceful. Perhaps a spell bag-packing at Asda is just what these embarrassing troublemakers deserve? And I know somebody who could supervise that! Keep the Bugles coming, Mr. Bugler!